On September 14, 2018 Rick Salkin filed suit against John Labrosse, Frances Cogelja, Lance Powell, Carlos Velez, and Wendy Martinez (the three candidates for Board of Education and their campaign manager) in their individual capacities and Visions Media and Philip Swabinski (Labrosse's campaign consultant that you the tax payers are funding....), the City and the Board of Education. His complaint stems from their attack ads against Salkin (despite his not being a candidate for Board of Education) in the April 2018 school board election. His complaint, among other things, allege a violation of the First Amendment, the NJ Civil Rights Act, and Defamation. This evening, the city council voted to hire an attorney to defend John Labrosse. What is interesting of course is that John Labrosse is being sued in his individual capacity on certain claims, yet the City (we the tax payers, of course) appear to be affording him a defense on all claims (I say this because Thomas Cafferty the attorney for Labrosse filed that he is representing Labrosse on October 24 and no other attorneys have done so on the case--funny thing he did that on October 24 but wasn't authorized by the council until this evening). What is more interesting is that the city council authorized the hiring of an attorney at more than 3 times the standard rate that municipal attorneys are awarded. The city council authorized an attorney to defend John Labrosse at a rate of $500 per hour! The resolution authorizes up to $50,000 to be spent on Labrosse's defense before further authorization is needed. When questioned about why they are authorizing an attorney at such a rate that is inconsistent with rates for other attorneys on the city pad, City Attorney Steve Kleinman tipped his hat that it is out of not logical sense but an apparent personal vendetta against Salkin. Kleinman has advised that they have hired the best to attempt to have this case deemed frivolous and recover all costs from Salkin. If this lawsuit is disposed of in Labrosse's favor, the quickest way to do so would be a motion seeking an order of summary judgment. In this case, it is really up in the air in my eyes as to whether or not Salkin would be considered a "public official." If he was considered a public official, the chances of being granted summary judgment are higher as the burden to prove defamation against a public official is so very high. In order for fee shifting to come into play, the judge's order granting summary judgment would need to definitively state that the lawsuit was frivolous. Now I am no lawyer but I have been involved in defamation claims (ironically, with Salkin) and have read hundreds of defamation cases, if I were a betting man I would not be betting on a judge penning "frivolous" into any order. Rather than guide the course of litigation and make logical decisions in the best interest of the parties (mainly to my concern we the tax payers' purse) involved, we are going to try to rack up the biggest bill on the hope and prayer we can stick the highest bill to Salkin on a fee shifting decision. I am sure the canons of ethics say something about this type of apparent "strategy." Rather than wasting all of that $50,000 with inevitably more to be spent of our tax payer dollars when we are critically short police and fire personnel (whilst trying to jam an unfair labor contract down their throats as the bargaining chip to restore manpower and hire, yes... more on that coming in a subsequent story), maybe John Labrosse should put his homeowner's insurance on notice of claim. Defamation is covered under personal injury and homeowners and umbrella coverage would afford a defense to Labrosse under a reservation of rights. Why would Labrosse accept his insurance company's defense, and potential forced settlement, when we the tax payers can foot the bill? When I heard of this $500 per hour rate, I couldn't help but think that the attorney being hired was shaken down by the Labrosse team's bag man for campaign donations. I couldn't help but look up the attorney and the firm on NJ ELEC to see if they donated to Labrosse's campaign. Well, as far as I can tell they haven't (yet!). But what I do find hysterically ironic is the only campaign I can find that the firm donated money to was Joe Coniglio. Why do I find this so hysterically ironic? Because of course by this time next year they will also have donated to Labrosse and will then have donated to two Hackensack University Medical Center employees with very lenient work hours and schedules. I can't help but wonder every time I open the newspaper or the Labrosse facebook page, how can anyone with a regular work week (especially on the nice promotion and raise that was brokered by for Labrosse by the City Manager) never miss a ribbon cutting or other photo opp? 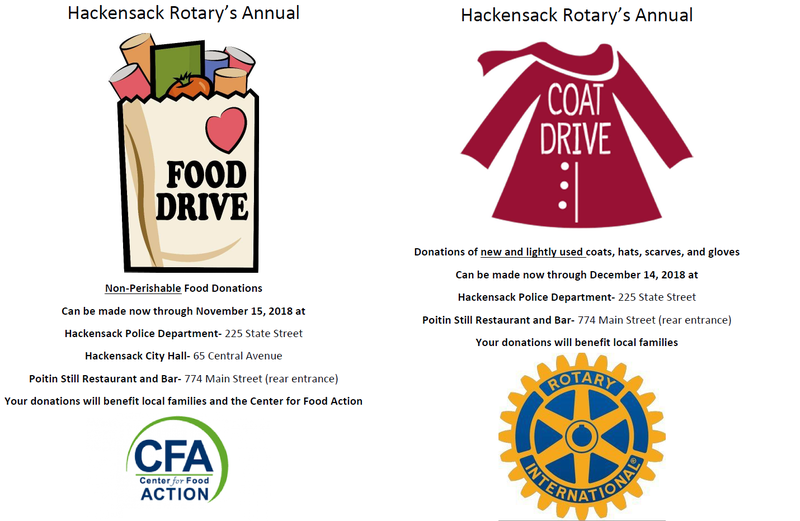 The Hackensack Rotary is holding their annual food and coat drives. Non-Perishable food items can be donated at the Hackensack Police Station, City Hall, and the Poitin Still Restaurant and Bar now through November 15th. New and lightly used coats, hats, scarves, and gloves can be donated now through December 14th at the Hackensack Police Station and Poitin Still Restaurant and Bar. Should you have any questions, please do not hesitate to reach out to HACKROTARYTIX@gmail.com. In today's high tech world with 24/7 media coverage available literally at your finger tips there are allegations that fly rampant of "fake news." Politics aside, we all see it everyday. Whether a conservative, liberal, or moderate, we all see the memes and posts disseminating fabrications, misrepresentations, and even at times outright lies, to serve a political end. We, as a polarized society, all have our favorite news sources with their right and left leaning tendencies. But in this high tech world where news can circulate the globe and touch millions of people in the matter of moments, it is more important than ever to know your source. For those who may not be history buffs--Pravda, or Russian for "the truth," was the official newspaper of the Communist Party of the Soviet Union. During the Soviet era, Pravda was circulated throughout all of Russia offering analysis on economic, social, cultural, and science, as well as "current events." The paper offered one sided coverage encouraging unity and promoting the "party line" serving as the mouthpiece for Lenin and Stalin. As a state-owned periodical, Pravda had more than a "leaning bias." It was political. The North Jersey Media Group (formerly Bergen Record) has long abandoned Hackensack news covering really nothing more than the scandalous high readership topics (you know, the "bad" news) such as the Zisa criminal case and civil lawsuits and recent police misconduct allegations. Such void of current events along with the rise of social media has made way for online media outlets such as Daily Voice, TAPinto, Patch and even blogs such as Hackensack Scoop. But like I said, in today's fast moving digital world where media is shoved in your face 24/7, know your source! Just as you wouldn't (well, unless you were a communist) have consulted Pravda for an objective analysis or news about soviet policies--would you rely on the Mayor, a council member, or the city's public relations firm for an objective analysis or news about the City of Hackensack? 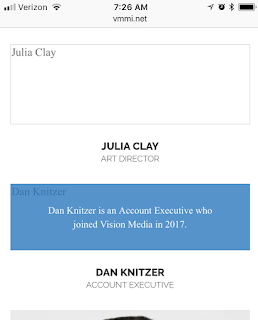 Meet Dan Knitzer. Dan is the Editor in Chief of TAPinto Hackensack. 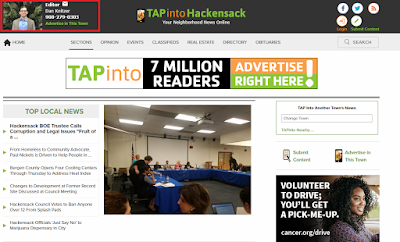 With a tag line "Your Neighborhood News Online," TAPinto Hackensack describes itself as "an all-online, objective, hyperlocal newspaper servicing the residents, business owners and organizations of Hackensack, NJ." Outside of Dan's work as the Editor in Chief and reporter for TAPinto Hackensack and various political activities, he is also an Account Executive for Visions Media Marketing. You may, or may not, recognize the name Visions Media Marketing. They are the public relations firm that represented the City of Hackensack prior to, and after, the 2017 municipal election in which the current council was elected. There was a brief break in their representation of the City of Hackensack (well the council) during the election to presumably avoid the conflict of interest present in Vision serving as public relations consultant and paid campaign manager for the council's election bid. Yes, you are reading this correctly. The "objective" news outlet TAPinto Hackensack, which you may be relying on for news about the City of Hackensack is run and written by an employee of the City's paid public relations consulting firm. Do you see any close similarities to that Pravda description earlier? Recent Board of Education coverage? A piece profiling Frances Cogelja's (the Labrosse backed candidate) position on the alleged wrong doings by the Business Administrator prior to her employment by the Hackensack Board of Education. While it is a sad and embarrassing thing that this former Business Administrator's name is now affiliated with Hackensack, the politicizing of it by Cogelja is inappropriate. She used it as an opportunity to blast the Board, Administrators, and the district. I can only wonder where Cogelja was to stamp her feet and scream from the roof tops when Thom Ammirato left Hackensack's employ under an agreement for non prosecution from BCPO. Well, that was different I guess.... that was a Labrosse supported hire! Other Hackensack coverage? Plenty of press releases and feel good stories about splash parks, banning marijuana sales, etc. No reporting of the $500,000 settlement for Dave Sims and Leo Battaglia's antics, no coverage of the council (4 of 5) facing massive fines for alleged violations of election laws, no mention of the council strong arming every collective bargaining unit through contract negotiations on multi-year expired contracts, no mention of the city cutting man power of the police officers on the road while we have had an increase in burglaries in the 5th ward, car break ins, and a shooting on First Street. Does that look like "objective" coverage? Or does it look like coverage that was intentionally one-sided in nature and served to prop up candidates running with the support of Labrosse's council? I contacted Knitzer by phone this evening prior to publishing this story. When asked if he worked for Visions Media he hung up the phone. I called Knitzer back and left a voicemail message asking him if he could explain to me how he manages the inherent conflict of interest when objectively covering news for the City of Hackensack while simultaneously working for the City's public relations consulting firm. I have not received a return phone call. I assume that Knitzer declines to comment. Sims and Battaglia Antics Cost Taxpayers over $500,000! Remember this scoop from September of 2014? It outlined the harassment and threats of retaliation that were being experienced by DPW and Sanitation workers by council members Dave Sims and Leo Battaglia. If you missed it, or need a refresher, take a few minutes to read it--it is unbelievable the bullying antics those two were (and reportedly are still) up to. 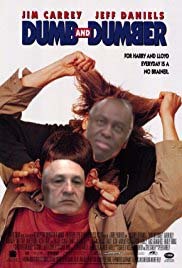 Well the complaints went unresolved, the harassment continued, and it eventually lead to a lawsuit filed by two employees, James Murrell and Christopher Haw, against the City of Hackensack and Councilmen Sims and Battaglia in their official capacities. The suit was quietly settled in late July for.... are you sitting down?.... $500,000! And that doesn't include the legal fees the City spent defending the two "Councilmen" (oh, but there is more coming on legal fees--a story is in the works, because in terms of lawsuits and legal fees, this council makes the Zisa crew they so continue to criticize look like altar boys). As a part of the settlement, Murrell retired from the City effective August 1st. August 1 just came, as you write your quarterly property tax checks, ask yourself if this is what you signed on for when you bought a home in Hackensack. We as residents and taxpayers deserve better! Hello Hackensack! I am back from a long hiatus. I have hammered the Council in this space on their lack of transparency and pay-to-play antics for some time. If you recall, in January of 2014, I called them out on their lack of campaign filings or disclosures for their "Victory Dinner" fundraiser which was a high priced cocktail hour--more of a who's who of trough feeding attorneys and other vendors looking for government contracts. At some point during the span of January 2014 to present, the New Jersey Election Law Enforcement Commission (NJ ELEC) has pored over the Council's campaign filings and bank records from the 2009 election in which John Labrosse was elected to the council, and the 2013 election when the Citizens for Change slate broke into City Hall (unfortunately like a gang of home invaders who have since wreaked havoc and turned the place upside down). In an eighteen page and ten count complaint served on John Labrosse, Kathy Canestrino, Leo Battaglia, Rose Greenman, David Sims, and the Campaign Treasurer Regina DiPasqua on July 25, 2018, the NJ ELEC outlines countless alleged violations of the New Jersey Campaign Contributions and Expenditures Reporting Act from 2009 through 2013. The alleged violations include making deposits of donations without proper documentation, making reimbursements for expenditures without proper documentation, taking contributions in excess of the allowable amount per donor, not making proper disclosures of large donations from partnerships and corporations, and simply not filing certain required reports and disclosures. Labrosse is the current Mayor, Canestrino and Sims share the post of "Deputy Mayor," and Battaglia is, well, a councilman. A former ally to the Citizens for Change team, DiPasqua has since become a harsh critic. Greenman resigned her post as a councilwoman and is still entangled in litigation with the City. She was replaced on the ticket by Stephanie Von Rudenborg. I attempted to calculate the total number of alleged violations and fines outlined in the complaint, and stopped counting when the meter went over $100,000. The group have the opportunity to be heard by NJ ELEC after filing an answer to the complaint, which is due within 20 days of the July 25th filing. Requests for comments from John Labrosse, Kathy Canestrino, Leo Battaglia, Rose Greenman, and Dave Sims went unanswered. Rick Salkin, Esq., denies all wrongdoing on behalf of his client, Regina DiPasqua. Salkin expects to ultimately receive a full exoneration on behalf of his client. To the veracity of the allegations, Salkin contends that DiPasqua "has, and had, absolutely no knowledge." As for my own editorial comment, looking back on the 2013 election and the subsequent breakdown of the Citizens for Change team, we can all recall that the now "Labrosse Team" (my how big his head has become) was propped up by the fundraising efforts of politicos such as Anthony Rottino (he got a nice job in the City after the election which ended in litigation and a $500,000 hush money settlement out of the City), Thom Ammirato (got a lucrative City contract before he left in disgrace narrowly escaping indictment on theft of services charges), Frank Catania (later appointed Municipal Prosecutor and then disbarred for putting his hand in the cookie jar, his trust account), among others. With such political muscle involved in the 2013 election, I doubt that DiPasqua was much more than a Treasurer in name only. Subscribe to have new posts emailed to you!